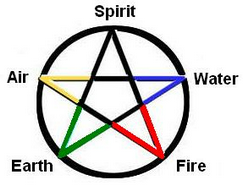 the magic circle and with a hierarchy of spirits or elementals, representing elements of nature. Fifth element, spirit forms top of pentacle, which in turn is the most important symbol of wicca. • Power of Spirit - makes you human being. This is my vision and it explains Spirit as such. For example, protection ritual performed with your blood (Power of Blood) is the most effective you can encounter ever, because you devote (Power of Spirit) own life for protection through formalities (Power of Mind) of the ritual. Powers are amounts of energy to perform specific job. Human powers are more easy to manage (especially if you maintain Mind preparation), but they take your own energy. Perform regular Energy ceremonies to "charge" from Sun or Moon. You can feel powers with fingerprints, pointing fingers on a source from a few inches distance. Begin practicing with your open palm when move forearm to and from palm to feel own energy (aura). As the first practical result, you'll be able to transfer own thoughts or desires touching someone's pulse area (usually in a handshake). Selection of power to employ in ritual depends on source you have and on your ability to manage this source. For example Power of Fire is employed usually to eliminate disease or destroy bad will. However, if you on Niagara falls, use of Power of Water will be far more effective. To see your ability to manage power in specific ritual, make Mind preparation and Energy ceremonies and listen own feelings about each power and their signals. If you feel positive signal, you can manage this power in this case. However even the same power may give you different signals. For example, newbie will definitely receive absolutely different signals from Power of Water on Niagara falls and on Palm Beach simply because of lack of control under Power of Mind. Which means more preparations and dedication for this newbie. 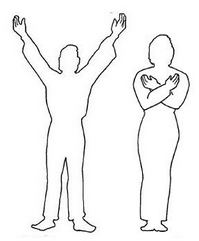 The most popular way to feel circulation (creation and release) of powers is to create a cone of power: raising arms (Goddess position) to release power and lowering arms (God position) to be open. In a group (coven) cone of power done by dancing, drumming and perhaps employing visualizations. Raising the cone of power is mentioned in eWicca ceremonies, but you may follow also procedures described by such authors as Gardner or Crowley. 1. Meditation or concentration: wiccan gains a clear idea of the purpose of the ritual, eliminating all other thoughts and distractions and focusing all attention on the task at hand. Meditation techniques include breath control (pranayama), steady and balanced posture (asana), finger and hand gestures (mudra) and chanting (mantra). This was implemented in eWicca. 2. Chants, spells, invocations. Chants are spoken or sung slowly at first, then increased in tempo to shrieks. Invocations are invitations or appeals to the deities for help. This was implemented in eWicca. 3. Trance or astral projection: there are different techniques to reach this state and neither is possible to implement in eWicca. 4. Incense, wine and drugs: person should have strong mentality to follow this way. 5. Dancing: fast tempo may lead to trance. 6. Blood control and use of cords: restricting blood flow with binding cords alters consciousness. 7. Scourging: a milder form of blood control explained above, which draws blood away from the brain.